Do your kids know the difference between fun surprises and unsafe secrets? Helping them understand this distinction can provide guidance to them in tough situations. Surprises are usually fun and have an ending when they are revealed. One of my favorite surprises growing up was when my mom, my brothers and I would make Gingerbread Man cookies as a surprise treat for my dad when he came home from work. My younger brother had a tough time keeping the surprise until dessert time. My older brother and I encouraged him not to say anything so it would be a surprise. Much to our chagrin, he found a way around this by announcing to my dad upon his arrival home "We didn't make gingerbread cookies today!" Surprises typically have a good intention like birthday presents or surprise parties. The surprise ends when it is revealed. On the other hand, secrets are something meant to be kept indefinitely. 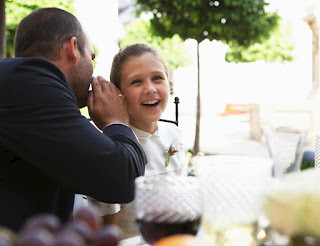 Teach your child that if an adult says something like “Shh … don’t tell.” or “This is our little secret.”, this means they should tell you or another trusted adults. Even if the adult threatens to do something bad to your child or someone else, your child needs to know that they should tell.